A legendary model more accessible than ever. 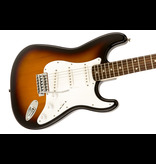 The Squier Affinity Stratocaster, Laurel Fingerboard Brown Sunburst brings all of the classic Strat sound quality and style into an extremely affordable model. A top-class rock and roll machine. Capture amazing tonal range. The Squier Affinity Strat's perfect blend of alder, maple, and Indian laurel tonewoods gives you perfect sharpness and definition at every frequency. Playability is at the absolute maximum thanks to a comfortable C-shaped neck profile. You'll be able to practice and perform for long stretches of time without the problem of cramp. Experiment with your pitch with ease. A synchronised tremolo bridge allows you to perform pitch bends with simplicity using the guitar's whammy bar. The original Strat is a music legend that has appeared in the work of Jimi Hendrix, The Who, Pink Floyd, and The Beatles to name but a few. 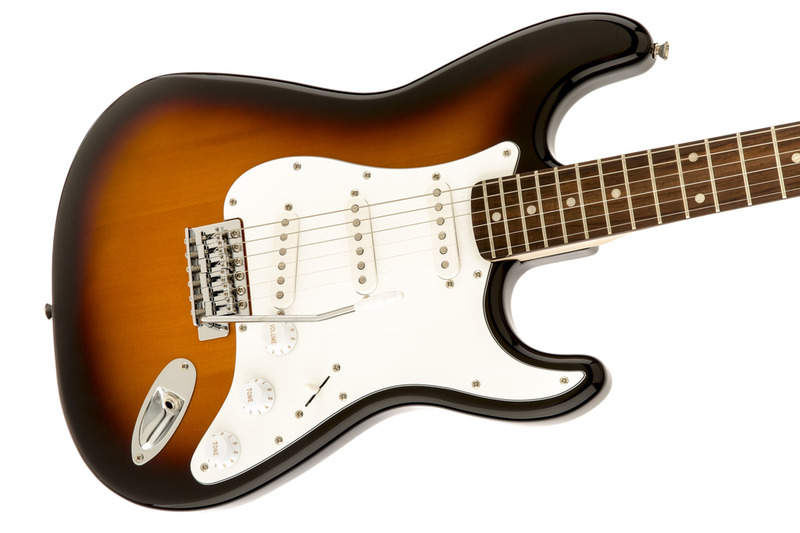 This Squier Affinity model brings all of the Stratocaster's iconic sound into a guitar accessible to everyone. Supreme playability. A C-shaped neck profile helps you play as freely as possible, for as long as possible. The profile is specifically designed to sit perfectly in the palm of your fret-hand. This eliminates hand cramp and allows you to practice for long periods to hone your skills, or exhilarate audiences with live performances that can go on and on. Furthermore, the Affinity Strat's maple neck is extremely smooth. This allows you to glide up and down the frets with ease. You'll be able to play at rapid speed comfortably with a neck that's built for soloing and fast-paced playing. The sleek, comfortable profile is well-suited to players of all ability levels. Striking and bold with a magnificent vintage feel. 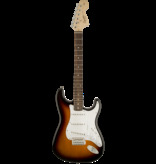 Stratocasters are well known for their sleek, incredibly attractive aesthetic. In the Affinity Series Stratocaster, Squier by Fender have crafted an instrument of unparalleled elegance that would slot comfortably into a gallery of history's most beautiful guitars. An eye-catching, brown sunburst finish gives a classic, cultured style to the instrument, and glittering chrome hardware adds a stunning shine and gloss. A brilliant white pickguard provides a classy contrast to the colour, and the guitar is finished off with a two-colour "Squier by Fender" headstock logo in black and gold. Pure elegance. Fantastic tone in any key. A wonderful blend of high-calibre tonewoods makes the Squier Affinity Strat a supremely versatile instrument that sounds amazing at any pitch. Enjoy full-bodied tones with plenty of depth courtesy of a solid alder body. This will give each chord you strike dominating power and voice. Solo with incisive sharpness. A maple neck and Indian laurel fingerboard combination can give each and every note punchy brightness. These woods provide a dynamic mid-range and scintillating high-end to complement the alder's bass-heavy qualities. A brilliant all-round guitar to help you achieve any sound you desire. In 1982, the Squier brand was reactivated as Squier by Fender, and began making lower-priced versions of Fender's classic, legendary guitars. 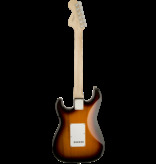 The Affinity Series has versions of Fender models ranging from the Jazz Bass, Telecaster, Jazzmaster, and Stratocaster. Each of the Affinity Series instruments strives to maintain the classic, unbeatable quality of the originals for a price that's accessible for all. The perfect guitars for beginners and experts alike who aren't looking to break the bank for a fantastic instrument. Matchless quality at unbelievable prices. Dimensions: 4.2" X 15.1" X 44.5"